At the time of writing this blog NO you can not play .ds2 (also known as DSS Pro, DSS stands for Digital Speech Standard) files in Express Scribe from NCH. I don’t envisage this changing in the near future either, the codec for the .ds2 file format is proprietary unlike .mp3 which is a free for all. Companies like Olympus and Philips spent good money developing this high quality, small size digital audio format and rightly don’t want to give that IP away to just anybody. Of course I am sure that if you want to buy a licence to process these files then you probably can but why would NCH spend large amounts of cash to add an extra audio file format to their massively popular free transcription software, Express Scribe. 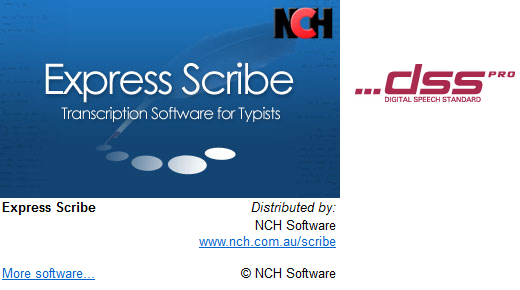 Hat’s off to NCH, Express Scribe is amazing software for $0 and I have long said that they should charge for it – alot of people would happily pay. Now that you are feeling demoralised, depressed and the fear of actually having to spend some money is looming largely over you here comes the good news, there are ways around this. This solution varies greatly depending on which operating system the transcriber has, the operating system the person who owns the digital voice recorder which is generating the .ds2 audio file has and the software which came with the digital voice recorder. For example the Olympus DS-2400 comes with DSS Player Standard (for Windows) whereas the Olympus DS-3400 and DS-5000 come with DSS Player Pro (for Windows), the Pro and the Standard software have different functionality. If after reading that earlier post you are still not sure of your best option please feel free to comment with your question or concern and we will happily help you out. Thank you for giving me some hope. And I can only agree with you in regard to the comment on Express Scribe. Have been using it for years and years and until recently had no problem with clients sending in .dss or .wav files. Now a client (and I do very little transcription) has purchased a dictation machine from a recommended (by me) supplier and has saved to .ds2. Well I am sure they (the supplier) will try to steer me to get the Olympus but will check your Options site for the “good news”. Sigh.